Begonia lovers have a vast array of growing choices for both indoor and outdoor growing. The common annual begonias that often fill flower gardens during the summer are the semperflorens begonias. Tuberous begonias grow easily in containers and hanging baskets and bloom prolifically throughout the summer and fall. Rex begonias deliver striking foliage colors to indoor growing locations. Assess potted begonias in the spring to determine whether they need repotting. Assess the begonias to determine whether they need a larger or smaller pot. If a begonia begins to wither and fall over and the roots begin to decay, this indicates that too much soil is providing more nutrients than the plant can tolerate, and the begonia needs a smaller container. 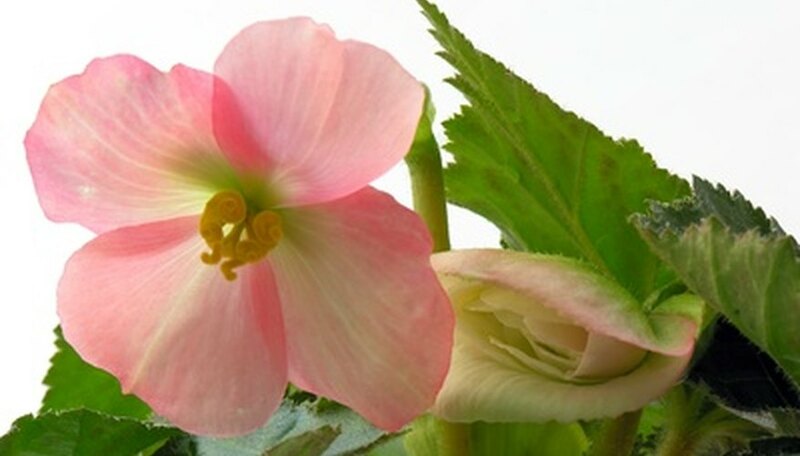 If a begonia stops growing energetically and putting forth few blossoms, this indicates the pot is too small and the begonia needs a larger container. If you notice accumulated fertilizer on the top of the soil or the plant seems to lack growing energy, often repotting the begonia in fresh soil will rejuvenate it. Select a planting container in an appropriate size for the size of the plant. The outside perimeter of the container should be about 2 inches larger than the root system of the begonia. Fill the bottom of the planting container with 1 to 2 inches of gravel to facilitate proper drainage through the bottom drainage holes. Add potting soil above the gravel to fill the container approximately half-full. Remove the begonia from its current growing container carefully. Loosen the soil gently and pull the plant from the container, taking care not to disturb the root system. Look at the roots while you have the begonia out of the pot to assess their health. If you find roots that appear unhealthy or dead, remove them with the pruning shears back to the point where the roots look white and healthy. Place the begonia into the new container, situating it with the crown of the plant slightly lower than the rim of the pot. Fill in additional potting soil around the roots and firm the soil around the top of the container with your hands. Water the repotted begonia generously immediately after you finish transplanting it and place it back in its growing location.